Tracey Turnblad (Freya Sutton), may not have the tiny waistline of the dancers on the Corny Collins Show, a local entertainment TV series in Baltimore, but she has oodles of enthusiasm and she can really bust a move. So when the show opens up auditions for a new dancer Tracey cuts school with her best friend Peggy Pingleton (Monique Young) to try out. But with bitchy producer Velma Von Tussle (Claire Sweeney) laughing Tracey out of the door before she has even had a chance to show off her impressive dance skills, it seems it's not meant to be for the Baltimore teen. Not one to give up easily, however, when class mate Seaweed (Dex Lee) teaches her moves from the coloured part of town, Tracey decides to give it one more shot – by showing off her skills to Corny Collins (Jon Tsouras) himself and at the same time making a stand for racial integration. I have seen the 2007 film version of this bright and cheerful film, with a great message at its core, too many times to remember. The cast was fantastic and the music by Marc Shaiman and Scott Wittman (who also worked on the excellent Catch Me If You Can and Charlie and the Chocolate Factory together, not to mention fictional musical Bombshell for television series Smash) is one of the most fun and memorable to have made its way into a modern musical. Despite my love for the latest film adaptation, I'd never actually seen the musical on stage as Hairspray played in the West End before I was living in London and for some reason I missed the UK and Ireland tour from a few years ago. So I was thrilled when I found out that this delightful show was making a return to the London stage with a new touring production and I was determined to not miss it again. The first hour of the show was everything I hoped it'd be and then some, as the cast delivered one fantastic high-energy performance after another with Good Morning Baltimore, The Nicest Kids in Town, Mama, I'm a Big Girl Now and I Can Hear the Bells. After that there was a bit of a lull but it was picked right back up with Welcome to the Sixties and act 1 showstopper Big, Blonde and Beautiful. Unfortunately the big bang (and hair) this show opened with was hard to keep up for the second act, which was considerably less memorable, both in songs and story, with the exception of the glittering grand finale. Freya Sutton was an incredible Tracey, bursting with energy, a contagious enthusiasm and a powerful voice befitting a leading lady. The rest of the young cast was also outstanding, especially Ashley Gilmour as love interest Link Larkin and Lauren Stroud as Amber, Velma's equally bitchy daughter. My favourite character is Penny and while Monique Young didn't get a chance to step into the spotlight much, moments of greatness shined through in the rare occasions that she did. One of the most interesting and unique parts of this musical has always been that Tracey's hefty mother is played by a male actor, and while Tony Maudsley is no John Travolta he was good enough, especially in his sweet duet with Tracey's father Wilbur (Peter Duncan). 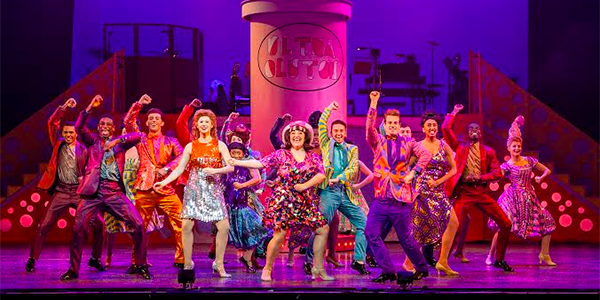 Hairspray's strongest point lays in the incredible heart that beams and shines through every scene, and the message of diversity that ripples throughout. Sure, the book may be a bit lacking in the middle and would be improved if it was tightened by an extra 20 minutes or so, but the spectacular finale ensures that even the most reluctant of audience members can't stop the beat and will have a huge smile plastered on their face long after leaving the theatre and returning back to the 21st century. Hairspray is running at the New Wimbledon Theatre until 7 November 2015, after which it will continue touring the UK to places such as Brighton, Birmingham, Newcastle, Aberdeen, Cambridge, Edinburgh, Bristol, Cardiff and Norwich until 21 May 2016. You can book tickets here.